Awareness of the need for improved sustainability in densely populated urban areas has been greatly heightened in the 21st century, particularly as the information age has enabled mankind to measure quantitative data in relation to the environment. Furthermore, many cities do not have the ability to add infrastructure and expand horizontally. This can lead to increased levels of traffic congestion, or excessive crowding on public transportation. 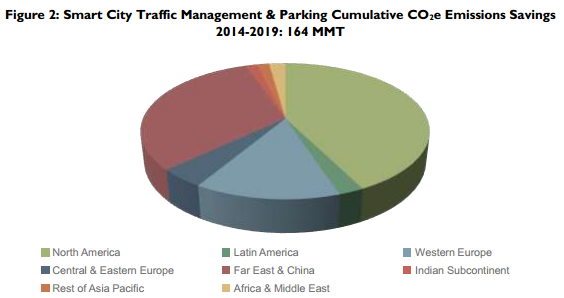 That said, the findings from a recent market study by Juniper Research indicate that Smart City traffic management and parking projects will reduce cumulative global emissions by 164 million metric tonnes of CO2 between 2014 and 2019 -- that's equivalent to the annual emissions produced by 35 million vehicles. Smart City initiatives can benefit the environment, while also positively impacting the quality of city dweller lives. With about 700 million automobiles projected to be on city roads across the globe by 2019, demand for innovative solutions to the challenges of growing communities has advanced. The Juniper study also found that high levels of city traffic congestion -- combined with advancements in Internet of Things (IoT) sensors and software solutions -- has driven plans to reduce high traffic levels through smart initiatives. Juniper analysts believe that the establishment of a sensor-networked and monitored city communications infrastructure -- efficiently phasing traffic lights, and providing real-time guidance to drivers -- can aid significantly in reducing urban congestion. Furthermore, digitally monitored parking spaces able to dynamically alter prices according to available spaces help control time spent cruising for city parking. Additionally, Juniper found that while purpose-built Smart Cities, such as Masdar and Songdo, can be considered a technological success, the benefits have not yet been fully realized owing to lack of citizen participation. "Cooperation between all parties, as we have seen in Amsterdam for example, is essential," said Steffen Sorrell, research analyst at Juniper Research. "Furthermore, cities need standards and open data to avoid information roadblocks." Smart grids will dramatically reduce energy consumption in cities through rapid smart meter deployment and intelligent distribution automation. Smart street lighting is also expected to produce significant cost savings, aided by the fall in LED fixture costs. Smart networked control systems will further add value.